I can hardly keep up with all of the recent airline mergers and acquisitions. Aviation tends to be in the news fairly frequently, last year being particularly eventful. I’m not sure if more is going on than in past years, or if I’m just paying more attention. Twitter keeps me pretty connected to the latest headlines. In response to the crash in Buffalo last year, the FAA has been revising crew fatigue and rest requirements. Airlines are beginning to hire again, and furloughees are being called back. United is in the process of merging with Continental. Pinnacle is buying Mesaba. TransStates is buying Compass. SkyWest is acquiring ExpressJet and merging it with ASA. ComAir announced drastic fleet reductions. Today, Southwest Airlines announced its plans to purchase AirTran. 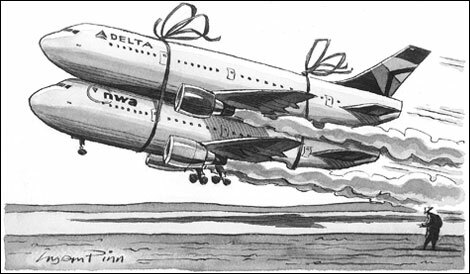 I remember being floored when I started hearing rumors of Delta and Northwest merging in 2008. My husband was in his first year with his regional airline, we’d just relocated to Detroit, and the national economy was taking a nosedive. Between Delta and NWA, there were approximately 10 regional airline contracts. I knew at some point, many of those airlines would either fold or get sold. Sky-high fuel prices have made many companies reconsider renewing contracts on fuel-inefficient aircraft. Tickets are getting more expensive to keep up with costs, and more planes are taking off full. I have learned that being married to someone in the aviation industry is unpredictable. When Taylor was hired, regionals were recruiting like crazy. Had the economy not tanked, he might be a captain right now. It’s exciting to see things moving again, but it’s worrisome to know how it will affect other families like us. It’s been tough living apart, and the commute is so hard on him. We are constantly scheming ways to live together and make it financially. We’ve lived in the same place for 14 months, but I honestly don’t know when or where we’ll be next. It’s hard to feel a sense of security when life has so much uncertainty. I can only hope that all this change will bring about good things.